A subdural hematoma (SDH) is a common neurosurgical disorder that often requires surgical intervention. It is a type of intracranial hemorrhage that occurs beneath the dura (essentially, a collection of blood over the surface of the brain) and may be associated with other brain injuries (see the images below). 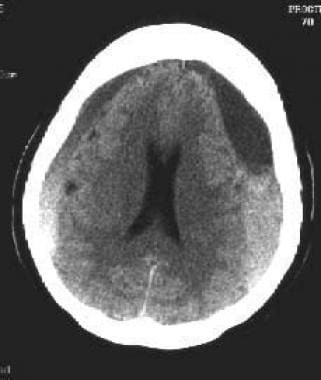 Left-side acute subdural hematoma (SDH). Note high signal intensity of acute blood and (mild) midline shift of ventricles. 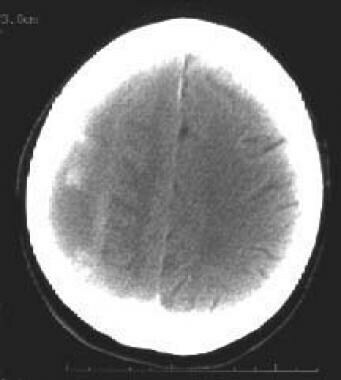 Left-side chronic subdural hematoma (SDH). Note effacement of left lateral ventricle. SDHs can be associated with high mortality and morbidity, even when the best medical and neurosurgical care is provided. They are usually caused by trauma but can be spontaneous or result from a procedure (eg, lumbar puncture). Anticoagulation (eg, with heparin or warfarin) may be a contributing factor. In the late 19th century, with the rise of medicine, development of aseptic technique and anesthesia, and establishment of the basic principles of neurologic localization, surgery for intracranial lesions (including SDH) became more common and, later, survival rates improved. In 1883, Hulke first described successful neurosurgical treatment of chronic SDH. Although cerebral angiography could be used to localize SDHs in the early-to-middle 20th century, the development of computed tomography (CT) in the late 1970s represented another leap in patient care. See also Subdural Hematoma, Emergent Management of Subdural Hematoma, Imaging in Subdural Hematoma, Closed Head Trauma, Head Injury, and Forensic Autopsy of Blunt Force Trauma. As the name implies, the subdural space is under the dura but above the pia-arachnoid that is intimately associated with the cortical surface. SDHs are usually hemispheric in location, but they may occur along the falx, the tentorium, or in the posterior fossa. An SDH usually forms after the rupture of a bridging vein. These run from the cortical surface to the dura. Bridging veins are most commonly found along the sagittal sinus and around the anterior tip of the temporal lobe. The source of bleeding may or may not be found at the time of surgery. The mortality of acute SDH has been reported to be in the range of 36-79%. Many survivors do not regain previous levels of functioning, especially after an acute SDH severe enough to necessitate surgical drainage. Favorable outcome rates after acute SDH range from 14% to 40%. Several series have shown an increase in favorable outcome in younger patients. Ages younger than 40 years were associated with a mortality of 20%, whereas ages of 40-80 years were associated with a mortality of 65%. Ages older than 80 years carried a mortality of 88%. Findings demonstrated by means of CT or magnetic resonance imaging (MRI) may help indicate prognosis. Such findings may include the thickness or volume of the hematoma, the degree of midline shift, the presence of associated traumatic intradural lesions, and the compression of the brainstem or basal cisterns. The first CT scan may underestimate the size of parenchymal contusions. Elevated intracranial pressure (ICP) postoperatively indicates a poor prognosis and may indicate the severity of the underlying brain injury (eg, trauma or secondary infarction). Additionally, generally, a poor preoperative neurologic status may be a harbinger of a poor outcome. Outcome after drainage of a chronic SDH has also been found to correlate with preoperative neurologic status. Early diagnosis before a significant neurologic deterioration may correlate with a more favorable prognosis. No correlation has been found between preoperative CT findings and postoperative outcome. The mortality within 30 days of surgery is 3.2-6.5%. About 80% of patients resume their prehematoma level of function, and favorable outcomes occur in 61% of patients aged 60 years or younger and in 76% of patients older than 60 years. In a series by Mori and Maeda, 89.4% of patients with chronic SDH who were treated with a closed drainage system had a good recovery and 2.2% worsened. Old age, preexisting cerebral infarction, and subdural air after surgery correlated with poor brain expansion. Stanisic et al reported a 14.9% postoperative recurrence rate  ; various factors were associated with this. 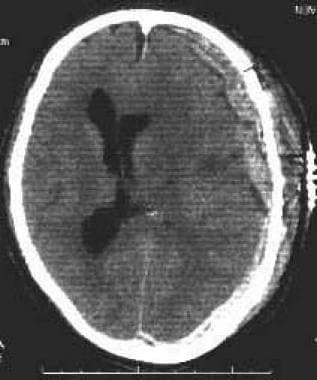 Isodense subdural hematoma (SDH). Note that no sulcal markings are below inner table of skull on right side. Acute subdural hematoma (SDH) as complication of craniotomy. Note significant mass effect with midline shift. Contraindications for surgery are determined on a case-by-case basis, depending on factors that relate to the patient's neurologic and medical condition. For example, a patient with a massive SDH may not be a surgical candidate if he or she has concomitant brain death, anticipated severe neurologic damage, coexisting brain lesions (eg, infarction), or a medical condition that contraindicates general anesthesia or surgery (eg, coagulopathy before correction). In addition, what is known of the patient's and family's beliefs and instructions may play a role in this decision. At the other end of the spectrum, small acute SDHs thinner than 5 mm on axial CT images without sufficient mass effect to cause midline shift or neurologic signs may be able to be observed clinically. MRI may be more sensitive than CT in detecting small SDHs (see the image below). 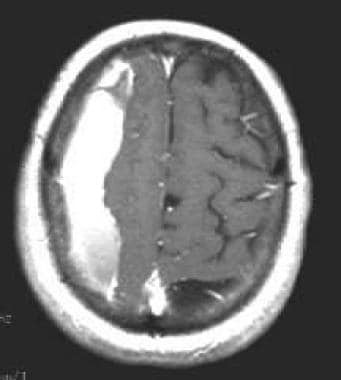 Isodense subdural hematoma (SDH) as pictured with magnetic resonance imaging (MRI). MRI can more readily reveal smaller SDHs, and, on MRI, imaging of blood products changes characteristically over time. A chronic SDH with minimal or no mass effect on imaging studies and no neurologic symptoms or signs except mild headache is often observed with serial scans and may resolve without surgical intervention. Surgery to manage an acute SDH usually consists of a large craniotomy (centered over the thickest portion of the clot) to decompress the brain; to stop any active subdural bleeding; and if indicated, to evacuate intraparenchymal hematoma in the immediate vicinity of the acute SDH. An SDH usually has a consistency that is too firm to allow removal through burr holes alone. Craniectomy (ie, the removal of the bone plate or flap) is also sometimes required, as when increased ICP is present or anticipated. Different methods for storing the bone flap for possible later replacement exist. Liquefied SDHs are commonly treated with drainage through one or two burr holes placed over the thickest aspects of the hematoma. Many surgeons place frontal and parietal burr holes that later can be incorporated into a frontotemporoparietal craniotomy, if needed. The dura is opened in a cruciate fashion, and the dural leaves are coagulated. A thin rubber catheter, often a ventriculostomy catheter, is carefully placed in the subdural space. Residual SDH is gently irrigated with saline solution until the irrigant is clear. The rubber catheter is redirected to different areas of the subdural space to irrigate the hematoma. Often, the brain does not reexpand right away. In these circumstances, the rubber catheter may be tunneled under the skin and left as a subdural drain. It is then connected to a closed drainage system placed at the level of the ear or slightly lower. A closed drainage system may be left in the subdural space for 24-72 hours postoperatively. Santarius et al found that placement of drains after drainage of chronic SDHs reduces recurrence and improves clinical outcome. Their randomized controlled trial in 269 adult patients with a chronic SDH for burr-hole drainage was stopped early because of a significant benefit in reduction of recurrence with drain placement. Chronic subdural hematomas (SDHs) are commonly bilateral and have areas of acute bleeding, which result in heterogeneous densities. Note lack of midline shift due to presence of bilateral hematomas. For twist-drill craniotomy, a hole is drilled at a 45° angle to the skull over the thickest part of the hematoma (unless this lies over the motor strip). The twist drill is used to perforate the dura and to release the subdural hematoma. A thin rubber catheter is gently guided into the subdural space, tunneled under the scalp, and brought out through a stab incision. It is connected to a closed drainage system that is set at the level of the ear or slightly below the craniotomy. In the mid-2000s, the Subdural Evacuating Port System (SEPS) was introduced, with initial encouraging results. In 2010, Kenning et al and Rughani et al published their results in using this system to treat SDHs. Kenning et al found not only that SEPS was safe and effective in the treatment of subacute and chronic SDHs but also that it would be ideal for patients unable to tolerate general anesthesia (eg, elderly, sick patients). In addition, SEPS was more effective in draining SDHs that were hypodense on CT than it was in evacuating mixed-density SDHs. Although one patient required urgent surgical subdural collection evacuation following iatrogenic injury, Kenning et al noted that significant bleeding was uncommon with SEPS insertion. Under certain circumstances, craniotomy is recommended for chronic SDH, depending on factors such as recurrence, the consistency of the hematoma, and the presence of membranes. In general, a poor preoperative neurologic status in a patient with acute or chronic SDH may be a harbinger of a poor outcome. Phenytoin is administered to decrease the risk of developing early posttraumatic seizures (within the first 7 days after the injury). Patients have an estimated risk of greater than 20% for developing posttraumatic epilepsy after an acute SDH. Whether this risk is modifiable with prophylactic anticonvulsants remains debatable. The patient is positioned supine with the head turned to the appropriate side. A shoulder roll is placed to help prevent jugular vein kinking. A three-point head fixation device should be used in patients with an unstable cervical spine fracture. The whole head is shaved to facilitate placement of an intracranial pressure monitor on the contralateral side, if desired. Infiltrating the scalp with 1% lidocaine (with 1:100,000 epinephrine) is unnecessary, but the short time taken to do this may hasten hemostasis. The standard reverse question mark incision provides wide access to the frontal, temporal, and parietal regions. The incision is started at the level of the zygoma within 1 cm anterior to the tragus. This allows for full temporal access and minimizes the possibility of injuring the anterior branch of the facial nerve. The incision is carried down to the bone and through the temporalis muscle; Raney clips are used to maintain hemostasis. The periosteum and the temporalis are then reflected with a periosteal elevator. The initial burr hole is made over the zygoma. The dura is opened, and the clot is removed with gentle suction and irrigation. The initial burr hole allows for early subtemporal decompression to forestall or ameliorate uncal herniation; it may be made before opening the entire incision. Additional burr holes are placed at the perimeter of the exposure, as needed, to facilitate turning the bone flap with a craniotome. The dura is opened in a cruciate fashion with a flap based on the sagittal sinus (see the image below). The remainder of the clot is removed with biopsy forceps, irrigation, and suction. Acute subdural hematoma is shown in this intraoperative photograph. Note frontotemporoparietal flap used. Hematoma is currant jelly–like in appearance. Bipolar electrocautery, gel foam, and absorbable cellulose (eg, Surgicel) are used to achieve hemostasis. If substantial brain swelling develops, a dural augmentation patch graft is placed, and the bone flap and overlying temporalis fascia are closed loosely. Subdural drains, subgaleal drains, or both may be placed, if needed, and the wound is closed. The standard trauma craniotomy flap, which was developed at the dawn of the CT era, exposes most acute traumatic SDHs. However, today's rapid CT scanners almost always elucidate the SDH's location preoperatively. Therefore, linear incisions have become an effective surgical option in trauma cases. Linear incisions may offer advantages over the standard reverse question mark incision. Because they are shorter for a given-size bone flap and less time is spent controlling bleeding, linear incisions reduce surgical time. They may be extended easily across the midline to control bleeding from a distant, intraoperatively identified source. Linear incisions also eliminate issues regarding a vascular pedicle. If the cerebellar retractors used to keep the incision open are placed in a crossed axis configuration (ie, to maintain a hexagonal opening), Raney clips may be unnecessary. Exploratory burr holes are rarely indicated but sometimes may be used as life-saving measures. Patients with head injury can be rapidly triaged and evacuated to trauma centers that have CT scanners, making exploratory burr holes a thing of the past. However, burr holes can be used for emergency decompression in patients who show signs of rapid herniation if circumstances prevent access to radiographic studies. 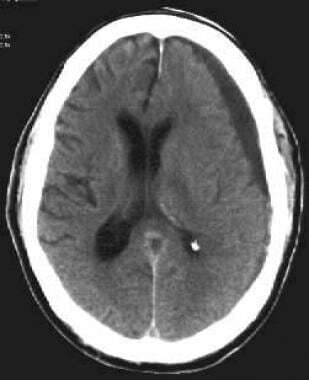 Acute traumatic SDHs are often associated with acute brain swelling. 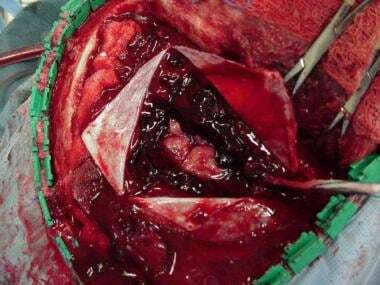 Ironically, rapid decompression of acute traumatic SDHs via craniotomy in these patients may potentiate damage to the brain by allowing it to herniate through the craniotomy defect. In a series of 31 patients operated on in this manner, more than 80% of the clot was removed in 29 patients as demonstrated by CT. Eighty seven percent of patients had presented with a GCS score of 8 or lower, and the mortality for that series of patients was 52%. When an acute subdural collection is evacuated, intraoperative ultrasonography may be helpful for locating intraparenchymal clots, which also may require evacuation, depending on the risks and benefits involved. Perioperative antibiotics may be administered to decrease the risk of postoperative infection. Postoperative CT scans often show a residual subdural fluid collection. This usually should be left alone, unless it continues to exert significant mass effect. 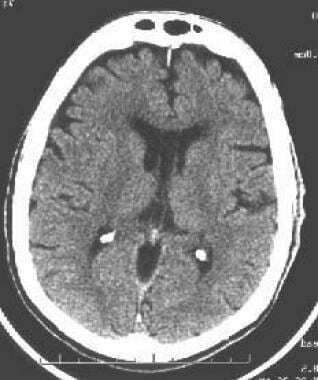 Elevated ICP postoperatively indicates a poor prognosis and may indicate the severity of the underlying brain injury (eg, trauma, secondary infarction). After the evacuation of an acute SDH, medical treatment is aimed at keeping the ICP below 20 mm Hg and maintaining the cerebral perfusion pressure above 60-70 mm Hg. 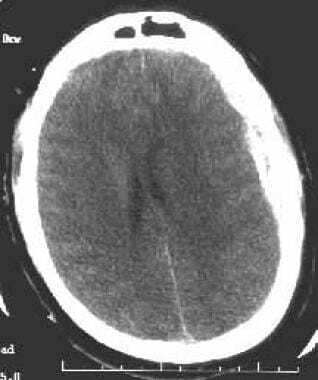 If elevated ICP is an issue postoperatively, an urgent CT scan should be obtained to look for a new intracranial mass lesion or reaccumulation of the SDH (see the image below). Serial neurologic examinations are used to determine the patient's subsequent clinical course (whether the patient is stable, improving, or deteriorating). Depending on the severity of the neurologic injury, patients may require physical therapy, occupational therapy, long-term rehabilitation, or even nursing-home placement. A follow-up CT scan is usually obtained within 24 hours of acute subdural collection removal and as needed to monitor for residual hematoma and recurrence. Although CT alone is usually sufficient for short-term management, MRI of the brain is sometimes performed (after a patient is stabilized) to look for associated brain injuries. Serial imaging studies may be necessary to confirm that the acute SDH has fully resolved; a residual hematoma could become a symptomatic chronic subdural collection. This transformation can occur regardless of whether the hematoma has been managed surgically or conservatively. Postoperative coagulation studies (prothrombin time [PT], activated partial thromboplastin time [aPTT]) and platelet counts should be observed closely; when possible, adjustments should be made to lessen the risk of additional bleeding. After the evacuation of a chronic SDH, adequate patient hydration is needed to help reexpand the brain. In addition, the patient may be maintained on bedrest with the head of the bed flat to aid brain reexpansion by increasing the intracranial venous pressure. As with acute SDH, serial neurologic examinations are used and coagulation parameters may need to be followed. Serial CT scans are used to document the resolution of the chronic subdural collection. Depending on the patient, physical therapy, occupational therapy, long-term rehabilitation, or even nursing home placement may be needed. For patients who were on anticoagulation therapy preoperatively, no solution is perfect regarding when to restart anticoagulation therapy. The risks and benefits of anticoagulation must be weighed against the risks of rebleeding to determine when to restart therapy. The mortality for chronic SDH within 30 days of surgery is 3.2-6.5%. Parenchymal brain injury is commonly associated with acute SDH and can lead to increased ICP. Residual neurologic problems, as well as secondary events, can result from these associated injuries. As with every medical condition and treatment, inherent risks exist. Postoperatively, recurrent or residual hematoma might be present, which, if symptomatic, may require repeat operative intervention. As many as one third of patients experiences posttraumatic seizures after a severe head injury. Wound infection and cerebrospinal fluid (CSF) leak are possible after craniotomy. Meningitis or cerebral abscess can occur after any intracranial procedure, and constitutional signs of infection, delayed neurologic deterioration, or signs of meningeal irritation may necessitate further evaluation. A long list of potential complications may also be related to anesthesia and hospitalization but are not discussed here. Among patients with chronic SDH who underwent surgical drainage, 5.4-19% experience medical or surgical complications. Medical complications, including seizures, pneumonia, empyema, and other infections, occur in 16.9% of cases. Surgical complications, including acute subdural collection formation, intraparenchymal hematoma, or tension pneumocephalus, occur in 2.3% of cases. Following surgery for chronic SDH, even with normalization of ICP, a persistent space may exist between the brain and dura (see the image below), in that the brain may not expand to fill this space. Residual hematoma has been found on 92% of postoperative CT scans within 4 days of operation; however, clinical improvement may proceed regardless of the size of this collection. Atrophy of brain, resulting in space between brain surface and skull, increases risk of subdural hematoma (SDH). In another series, contralateral hematomas formed in 4% of patients who underwent drainage of unilateral chronic subdural collections. These occurred from 3 days to 6 weeks postoperatively. Postoperative seizures have been reported in 3-10% of patients. Whether prophylactic anticonvulsants therapy can decrease this risk is debatable. Subdural empyema, brain abscess, and meningitis have been reported to occur in less than 1% of patients after operative drainage of a chronic SDH. In these patients, numerous potential complications are also related to anesthesia, hospitalization, patient age, and concurrent medical conditions. Mashour GA, Schwamm LH, Leffert L. Intracranial subdural hematomas and cerebral herniation after labor epidural with no evidence of dural puncture. Anesthesiology. 2006 Mar. 104 (3):610-2. [Medline]. van den Doel EM. Balzac's 'Pierette'. An early description of chronic subdural hematoma. Arch Neurol. 1986 Dec. 43 (12):1291-2. [Medline]. Weigel R, Krauss JK, Schmiedek P. Concepts of neurosurgical management of chronic subdural haematoma: historical perspectives. Br J Neurosurg. 2004 Feb. 18 (1):8-18. [Medline]. Servadei F. Prognostic factors in severely head injured adult patients with acute subdural haematoma's. Acta Neurochir (Wien). 1997. 139 (4):279-85. [Medline]. Servadei F, Nasi MT, Giuliani G, Cremonini AM, Cenni P, Zappi D, et al. CT prognostic factors in acute subdural haematomas: the value of the 'worst' CT scan. Br J Neurosurg. 2000 Apr. 14 (2):110-6. [Medline]. Abe M, Udono H, Tabuchi K, Uchino A, Yoshikai T, Taki K. Analysis of ischemic brain damage in cases of acute subdural hematomas. Surg Neurol. 2003 Jun. 59 (6):464-72; discussion 472. [Medline]. Massaro F, Lanotte M, Faccani G, Triolo C. One hundred and twenty-seven cases of acute subdural haematoma operated on. Correlation between CT scan findings and outcome. Acta Neurochir (Wien). 1996. 138 (2):185-91. [Medline]. Wilberger JE Jr, Harris M, Diamond DL. Acute subdural hematoma: morbidity, mortality, and operative timing. J Neurosurg. 1991 Feb. 74 (2):212-8. [Medline]. Mori K, Maeda M. Surgical treatment of chronic subdural hematoma in 500 consecutive cases: clinical characteristics, surgical outcome, complications, and recurrence rate. Neurol Med Chir (Tokyo). 2001 Aug. 41 (8):371-81. [Medline]. Stanisic M, Lund-Johansen M, Mahesparan R. Treatment of chronic subdural hematoma by burr-hole craniostomy in adults: influence of some factors on postoperative recurrence. Acta Neurochir (Wien). 2005 Dec. 147 (12):1249-56; discussion 1256-7. [Medline]. Hori YS, Ebisudani Y, Aoi M, Fukuhara T. Elevated Serum Fibrinogen Degradation Products on Admission is a Novel Predictive Factor for Recurrence of Chronic Subdural Hematoma. World Neurosurg. 2018 Jul 16. [Medline]. Izumihara A, Yamashita K, Murakami T. Acute subdural hematoma requiring surgery in the subacute or chronic stage. Neurol Med Chir (Tokyo). 2013. 53 (5):323-8. [Medline]. Tosaka M, Sakamoto K, Watanabe S, Yodonawa M, Kunimine H, Aishima K, et al. Critical classification of craniostomy for chronic subdural hematoma; safer technique for hematoma aspiration. Neurol Med Chir (Tokyo). 2013. 53 (4):273-8. [Medline]. Fomchenko EI, Gilmore EJ, Matouk CC, Gerrard JL, Sheth KN. Management of Subdural Hematomas: Part II. Surgical Management of Subdural Hematomas. Curr Treat Options Neurol. 2018 Jul 18. 20 (8):34. [Medline]. [Guideline] Bullock MR, Chesnut R, Ghajar J, Gordon D, Hartl R, Newell DW, et al. Surgical management of acute subdural hematomas. Neurosurgery. 2006 Mar. 58 (3 Suppl):S16-24; discussion Si-iv. [Medline]. Tamura R, Kuroshima Y, Nakamura Y. Neuroendoscopic Removal of Acute Subdural Hematoma with Contusion: Advantages for Elderly Patients. Case Rep Neurol Med. 2016. 2016:2056190. [Medline]. Rush B, Rousseau J, Sekhon MS, Griesdale DE. Craniotomy Versus Craniectomy for Acute Traumatic Subdural Hematoma in the United States: A National Retrospective Cohort Analysis. World Neurosurg. 2016 Apr. 88:25-31. [Medline]. Phan K, Moore JM, Griessenauer C, Dmytriw AA, Scherman DB, Sheik-Ali S, et al. Craniotomy Versus Decompressive Craniectomy for Acute Subdural Hematoma: Systematic Review and Meta-Analysis. World Neurosurg. 2017 May. 101:677-685.e2. [Medline]. Miki K, Yoshioka T, Hirata Y, Enomoto T, Takagi T, Tsugu H, et al. [Surgical Outcome of Acute and Subacute Subdural Hematoma with Endoscopic Surgery]. No Shinkei Geka. 2016 Jun. 44 (6):455-62. [Medline]. Kuge A, Tsuchiya D, Watanabe S, Sato M, Kinjo T. Endoscopic hematoma evacuation for acute subdural hematoma in a young patient: a case report. Acute Med Surg. 2017 Oct. 4 (4):451-453. [Medline]. Matsumoto H, Minami H, Hanayama H, Yoshida Y. Endoscopic Hematoma Evacuation for Acute Subdural Hematoma in the Elderly: A Preliminary Study. Surg Innov. 2018 Jul 1. 1553350618785270. [Medline]. Santarius T, Kirkpatrick PJ, Ganesan D, Chia HL, Jalloh I, Smielewski P, et al. Use of drains versus no drains after burr-hole evacuation of chronic subdural haematoma: a randomised controlled trial. Lancet. 2009 Sep 26. 374 (9695):1067-73. [Medline]. Emich S, Richling B, McCoy MR, Al-Schameri RA, Ling F, Sun L, et al. The efficacy of dexamethasone on reduction in the reoperation rate of chronic subdural hematoma--the DRESH study: straightforward study protocol for a randomized controlled trial. Trials. 2014 Jan 6. 15:6. [Medline]. [Full Text]. Horn EM, Feiz-Erfan I, Bristol RE, Spetzler RF, Harrington TR. Bedside twist drill craniostomy for chronic subdural hematoma: a comparative study. Surg Neurol. 2006 Feb. 65 (2):150-3; discussion 153-4. [Medline]. Muzii VF, Bistazzoni S, Zalaffi A, Carangelo B, Mariottini A, Palma L. Chronic subdural hematoma: comparison of two surgical techniques. Preliminary results of a prospective randomized study. J Neurosurg Sci. 2005 Jun. 49 (2):41-6; discussion 46-7. [Medline]. Wang QF, Cheng C, You C. A New Modified Twist Drill Craniostomy Using a Novel Device to Evacuate Chronic Subdural Hematoma. Medicine (Baltimore). 2016 Mar. 95 (10):e3036. [Medline]. Hwang SC, Im SB, Kim BT, Shin WH. Safe entry point for twist-drill craniostomy of a chronic subdural hematoma. J Neurosurg. 2009 Jun. 110 (6):1265-70. [Medline]. Lollis SS, Wolak ML, Mamourian AC. Imaging characteristics of the subdural evacuating port system, a new bedside therapy for subacute/chronic subdural hematoma. AJNR Am J Neuroradiol. 2006 Jan. 27 (1):74-5. [Medline]. Kenning TJ, Dalfino JC, German JW, Drazin D, Adamo MA. Analysis of the subdural evacuating port system for the treatment of subacute and chronic subdural hematomas. J Neurosurg. 2010 Nov. 113 (5):1004-10. [Medline]. Rughani AI, Lin C, Dumont TM, Penar PL, Horgan MA, Tranmer BI. A case-comparison study of the subdural evacuating port system in treating chronic subdural hematomas. J Neurosurg. 2010 Sep. 113 (3):609-14. [Medline]. Temkin NR, Dikmen SS, Wilensky AJ, Keihm J, Chabal S, Winn HR. A randomized, double-blind study of phenytoin for the prevention of post-traumatic seizures. N Engl J Med. 1990 Aug 23. 323 (8):497-502. [Medline]. Guilburd JN, Sviri GE. Role of dural fenestrations in acute subdural hematoma. J Neurosurg. 2001 Aug. 95 (2):263-7. [Medline]. Miele VJ, Sadrolhefazi A, Bailes JE. Influence of head position on the effectiveness of twist drill craniostomy for chronic subdural hematoma. Surg Neurol. 2005 May. 63 (5):420-3; discussion 423. [Medline]. Ernestus RI, Beldzinski P, Lanfermann H, Klug N. Chronic subdural hematoma: surgical treatment and outcome in 104 patients. Surg Neurol. 1997 Sep. 48 (3):220-5. [Medline]. Stroobandt G, Fransen P, Thauvoy C, Menard E. Pathogenetic factors in chronic subdural haematoma and causes of recurrence after drainage. Acta Neurochir (Wien). 1995. 137 (1-2):6-14. [Medline]. Disclosure: Received consulting fee from Synthes Spine for consulting; Received grant/research funds from Integra for none; Received consulting fee from Integra for consulting.